Beth Ann & Jessica's Helpful Savings: Vitacost: 13% Off Site-Wide, BabySpa Bathful Packs $11.24 Each! Vitacost: 13% Off Site-Wide, BabySpa Bathful Packs $11.24 Each! Vitacost is celebrating with 13% off everything! Use code PROUDTOBE3. Free shipping on orders over $49, plus get $10 off $30 when you sign up through this link here: $10 off $30 purchase for new customers. Get vitamins, nutritional supplements, peanut butter, whey powder, baby diapers and foods, tons of organic items, spices, pet supplies, gluten free stuff, beauty items and more! 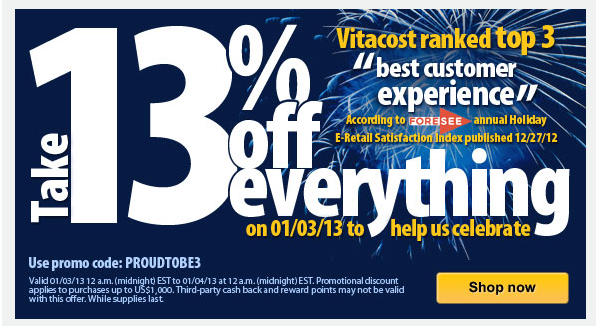 Vitacost brand right now is BOGO 50% off, so you can save even more! 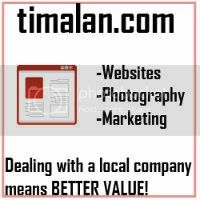 Remember your $10 coupon! 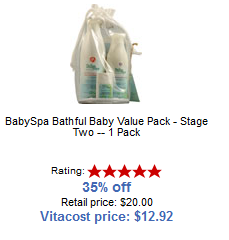 BabySpa Bathful Baby Value Pack - Stage Two -- 1 Pack $12.92, retail $20, save 35%! With promo code, these BabySpa packs are $11.24, so you could grab 3 at a price of $33.72, use your $10 coupon and get them for $23.72 plus shipping. That's 61% off original retail!